You’re picking on MOOC materials here but I’m not sure your question is even on their radar. (ie. They don’t seem to have given a lot of thought to the collision of their lecture videos with brick-and-mortar professors.) I’d rather you directed the question at pretty much every other OER advocate. 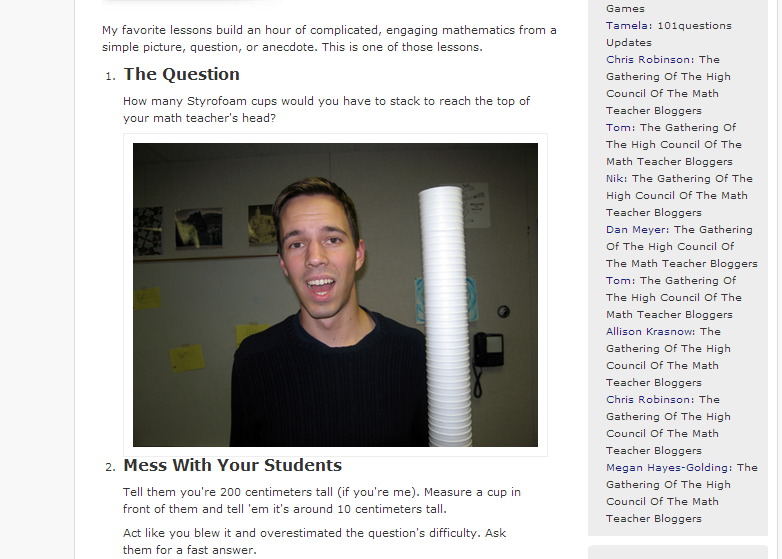 I think it’s great that Utah has developed a floor-to-ceiling math curriculum and that CK-12 puts out free PDFs. But we should question whether any of those materials will make teachers excellent. Dan, I couldn’t agree more — I’ve been pushing this same issue in the OER community for almost four years now. As a matter of fact, the first I heard of your blog was when I posted “Why I Am Focusing on Open TEACHING Resources” ( https://hapgood.us/2010/04/09/why-i-am-concentrating-on-open-teaching-resources/ ) back in 2010 — I’d written this post kind of in awe of the reuse that my wife was doing around internet-based open lesson plans in K-8, and a commenter emailed me and said basically, you’re almost right, but lesson plans aren’t quite what you want, take a look at this, and linked me to your work. As someone embedded in the OER community for way too long, I can say most of the current fight for useful teaching materials in OER tends to revolve around two things. First, designing for classroom reuse. This honestly is a ridiculous situation, but many people in OER production think OER objects are not designed for any purpose at all other than “to help with learning”, or that resources can be designed for all purposes at once. Just fighting to get people to realize that you have to choose a use case is hard. It is even harder to get people that have spent tens of millions of dollars producing OER but never sat down with teachers who use it to realize you have to talk to the people who use your stuff and solve the problems they have, not the problems your materials happen to solve. The second OER flashpoint ends up being the community around materials, and how it interacts with the materials. Many want there to be an elite community of people that produce materials and then a set of consumers. This is Candace Thille’s vision of OLI, for example — that educators should stay out of design, because they don’t have broad enough perspective. And the OLI designs reflect that. Other models exist though — in the distributed flip preso I mention AASCU’s Global Challenges work and the Kaleidescope Project — these initiatives (which have OER people in them) are very focused on the community around the teaching materials being as important as the materials themselves. Ds106 is another great example of a learning community and a teaching community built around digital resources and assignments. These are the places we need to be going. The idea of talking about the distributed flip (and yes, I know “flip” is problematic) is to get off of talking about good-MOOC/bad-MOOC and start looking at the implications of this broader digital resources trend for teaching. I don’t know if you know Amy Collier at Stanford, who heads up Teaching and Technology in the online initiatives, but you guys should really talk. We’ve been working together to try to use the MOOC craze to pull the camera back and think about what true networked TEACHING would look like, and I think your work in that area has profoundly influenced us both. Weirdly, we’ve never met outside of Twitter, but she seems like one of the good guys in this space. presentation but I in finding this topic to be actually something that I think I might never understand. his site, as here every material is quality based information.